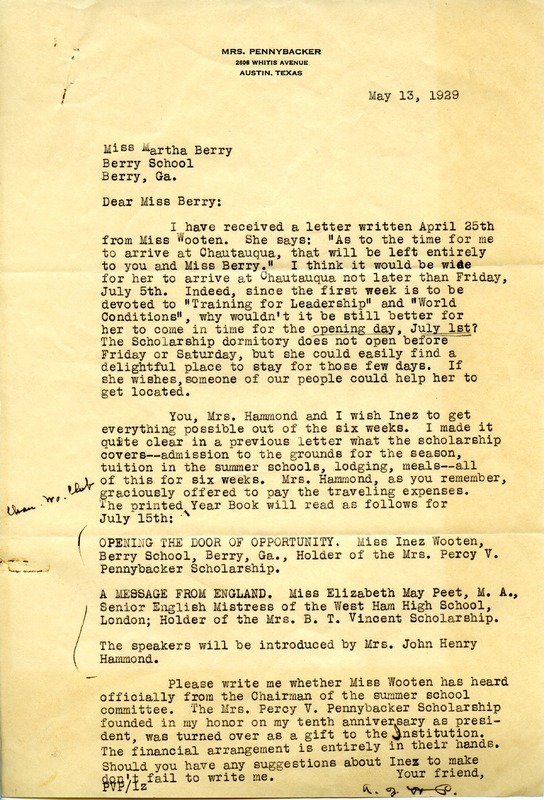 Mrs. Pennybacker writes to Martha about her arrival for the oepning of The Scholarship dormitory. Mrs. Pennybacker, “Letter to Martha Berry from Mrs. Pennybacker.” Martha Berry Digital Archive. Eds. Schlitz, Stephanie A., Jordan Brannen, Aaron Jackson, Chelsea Risley, et al. Mount Berry: Berry College, 2014. accessed April 25, 2019, https://mbda.berry.edu/items/show/13697.